It's best not to fool with a retired Latin teacher practiced with a dagger. With her long, brass letter-opener, Ann Grossman slices open the first of the six envelopes that her husband, Butch, has left for her on the living room table of their apartment at Martins Run in Media. It's from UNICEF, the United Nations Children's Fund. For the longest time, she had her suspicions about such bulk-mail solicitations. She'd hear from a favorite charity, and if she and her husband could, they'd send off a modest contribution. Within weeks, they'd hear from the charity again. "I was absolutely astounded at the number of requests we got," recalled the tiny 83-year-old. So she devised a little experiment: For an entire year, she'd track every letter and phone call, every calendar, pen set, member's card, or certificate of thanks some worthy cause employs to part the Grossmans from their retirement savings. "Excuse me if I look at my notes," she said Monday afternoon, opening the yellow spiral notebook in which she recorded and classified each pitch. Purple tabs help her determine whether she'd given the organization money before, when, and how much. UNICEF sent her 24 letters last year, according to her records. It called her at least once that she knows of. She last gave to the organization in June. That was when she contributed to two other groups whose fresh pitches arrived Monday: Smile Train (17 letters in 2010) and the American Red Cross (14). Doctors Without Borders (15) received a donation from the Grossmans in September. "Enclosed is our check for -- . Please make a note that this is the ONLY donation which we will make to your organization in 2011. Any more requests shall be unwelcome and unheeded. More solicitations shall be unproductive for you and add needlessly to your costs. In 2010 we recorded -- requests by phone and -- by letter." She has no confidence her declaration will make a difference, but it does make her feel better. If you think the couple are bombarded with pleas for money because they are heavy-hitters in the philanthropic world, think again. Last year, they contributed to 38 organizations. Typically, each one received $20 or $25. "I assume the reason we get so much mail is because the charities exchange mailing lists with each other," she said. That explains why so many similar causes try to tap the Grossmans' good will. "But," she added, "there was a solicitation from a lawn-tennis association in New Jersey that really puzzled me." The Grossmans have been married 54 years. They met in Albany, N.Y., during a community theater production of Uncle Harry. Ann was on stage, a few years out of Cornell, where she had studied classics. Butch, a decade her senior, was working for the U.S. Geological Survey and manning the curtain. After a rehearsal that she felt went terribly, she swept past him, and he complimented her work. "I certainly needed the lift," she recalled. "That was the first time I took notice of him." Recently, she called The Inquirer, hoping to publicize the results of her experiment. Her conclusion: During 2010, she received 678 letters from 164 charities. Times are tough indeed. If these organizations are so needy, she asked, why are they spending more on her than they can possibly expect to receive? To illustrate this point, she retrieved another shopping bag stuffed with art calendars, certificates of acknowledgment, personalized notepads, floral bookmarks, Christmas wrapping paper. The International Campaign for Tibet sent her a prayer-flag garland. An organization called Covenant House - "I don't know what they do," she said - has sent her a calculator, a pen, and a pocket notebook. By far, the most common thank-you token sent to the couple are sticky return-address labels, listing her and her husband's name in six different ways. She stopped logging the deluge Sept. 23 - it had become too tedious. By then, she had received 5,420 labels. 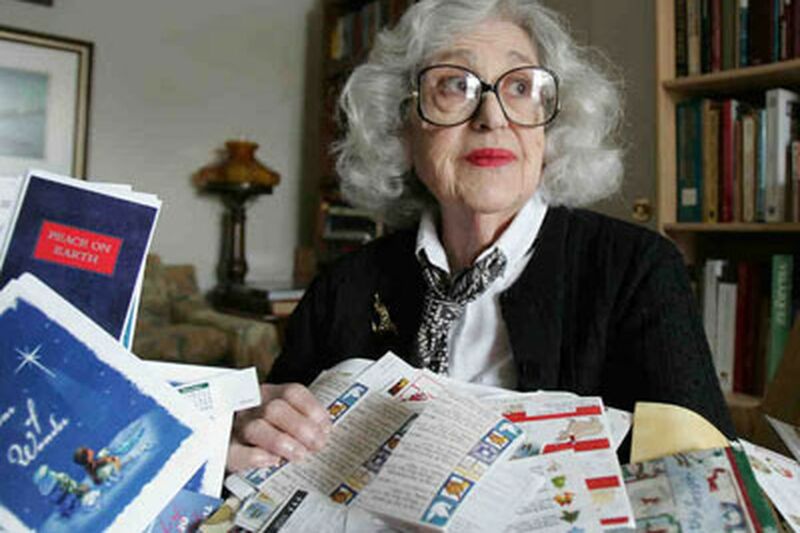 Figuring she sends someone mail about every third day, those labels should last her 48 years. "And that assumes that I don't get any more sent to me," she said. "Which I surely will."